The matchups are set for Saturday's 3A, 4A finals. Poly, Reservoir, Eleanor Roosevelt and Broadneck move on. 2020 forward Justin Lewis scored a game-high 23 points for the Engineers, who will look to win their third straight state championship on Saturday. "Our focus is to get another state championship," Lewis said, "and we just, like, kind of wanted to get after them and prove to these guys why we should be there, and I think we kind of got after it." Poly 2020 wing Brandon Murray had 14 points and 2020 guard Rahim Ali 13 to go with 7 assists. Quincy Haughton had 16 points to lead CM Wright, which was aiming for its first title trip since winning it all in 2016. Jalen Jackson added 12 and Corey Patterson 11 for the Mustangs. KyJuan McCallum led the Gators with 14 points while Josh Oduwono finished with 13 and 11 rebounds and Ryan Sanderson had 11 point. Is is the first-ever title game appearance for Reservoir, which won the 2018 DMVelite Fall League in the preseason. Emmanuel Powe had a game-high 19 for Thomas Johnson while also grabbing 11 rebounds. Richard Rivas added 14 points. 2019 guard Isaiah Gross his three free throws with 15.8 seconds remaining to lift the Raiders over the Lions in the opening night’s most exciting contest. The Raiders led by double digits before the Lions rallied to take the lead late. Gross was fouled shooting a 3 pointer, and sank all three for the final margin. The Coppin State commit finished with 16 points to led Roosevelt; he didn’t shoot well (2-of-12) but did his damage at the foul line (11-of-13) including the clutch makes at the end. William & Mary-bound 2019 guard Cam Brown had 15 points for Roosevelt, which returns to the 4A final for the first time since 2016. Jaamir Butler added 12 points for the Raiders. "We knew it would be a battle," Roosevelt coach Brendan O'Connell said. "I was really proud of our guys, because it wasn't looking good there for a couple of minutes, and they were just tough and found a way to get it done." 2020 wing Che Evans had 17 points to lead Dulaney, while 2021 guard Isaiah Cornish had 15, 2020 forward Cam Byers 12 and 2021 guard Ryan Conway 11. 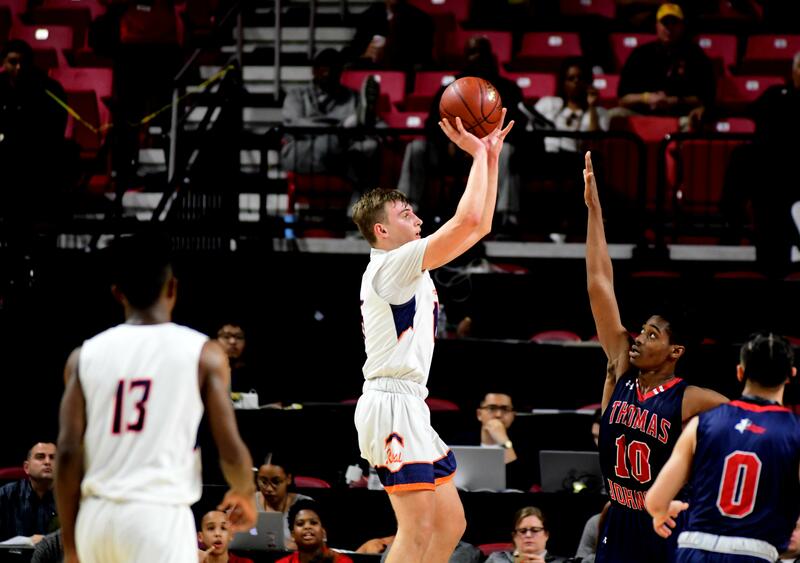 2020 forward Logan Vican had 19 points and 10 rebounds to lead the Bruins to a 4A state title showdown with Eleanor Roosevelt on Saturday. Che Colbert and Jamar Young had 16 points apiece for Broadneck. Kordell Lewis had 18 points to lead the Rockets, who got 13 points and 13 rebounds from Djorje Orcev and 12 points from 2019 forward Miles Gally.